1 Heat milk with 500 ml (approximately 1 cup) water and the sugar in a pot over medium heat. Brush corn ears and add to pot. Cook until kernels are crisp-tender, about 20 minutes. 2 Meanwhile, halve chile pepper lengthwise, remove seeds, rinse and dry. Finely chop chile. 3 Rinse cilantro, shake dry, pluck leaves and finely chop. Rinse lime in hot water, wipe dry and finely grate the zest. Squeeze juice from lime and mix 1 tablespoon juice with the cilantro, chile and olive oil. 4 Rinse chives, shake dry and cut into small rings. 5 Whisk butter until foamy, then mix in truffle oil, 1 teaspoon lime juice and the chives. Season with pepper. 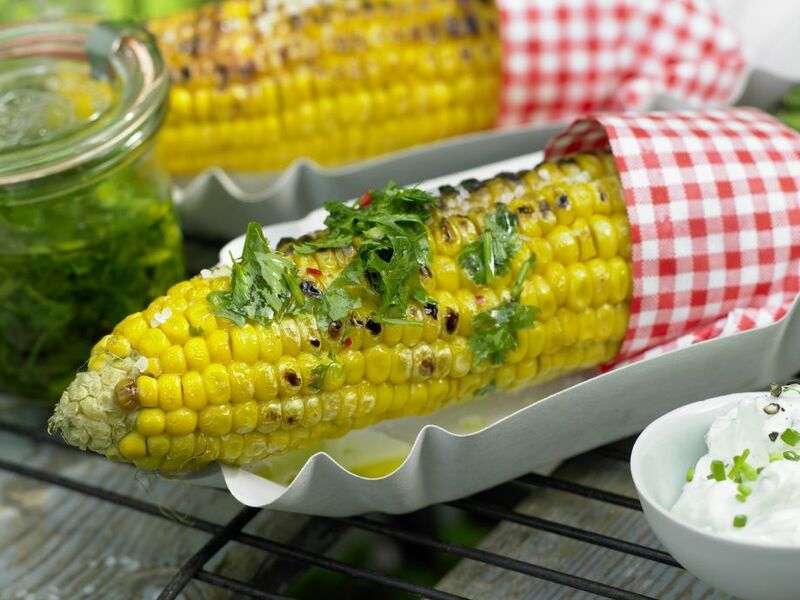 6 Remove corn from pot with a skimmer and cook on an oiled medium-hot grill until kernels are tender and charred in spots, 5-6 minutes, turning frequently. Transfer to a plate and serve with herb oil, truffle butter and sea salt.